When I studied opera singing a long time ago, I remember it was not so easy to practice with accompanists. In the conservatories or in the music schools, you could only enjoy a few minutes to work with them during your instrument or singing lesson. If you wanted to extra work, the accompanist was often laden with a crazy time schedule and could prefer working with some of his or her favorite students. It was also difficult be available in the right time slots to do chamber music with other chamber musicians ! Now every singer or musician can find digital solutions to cope with this issues. Any professional, amateur or music student can make, can create his or her own accompaniment experience. Indeed, there are a now quite a few solutions, some of them based on Artificial Intelligence, some of them rely entirely on talents and skills of true musicians. Among these digital new propositions, I have discovered recently pianoaccompanimentstracks.com. I was enthusiatic when I discovered this solution has just been created in the Ottawa/Outaouais river area by Mauro Bertoli a music teacher of Ottawa University, my Alma mater. 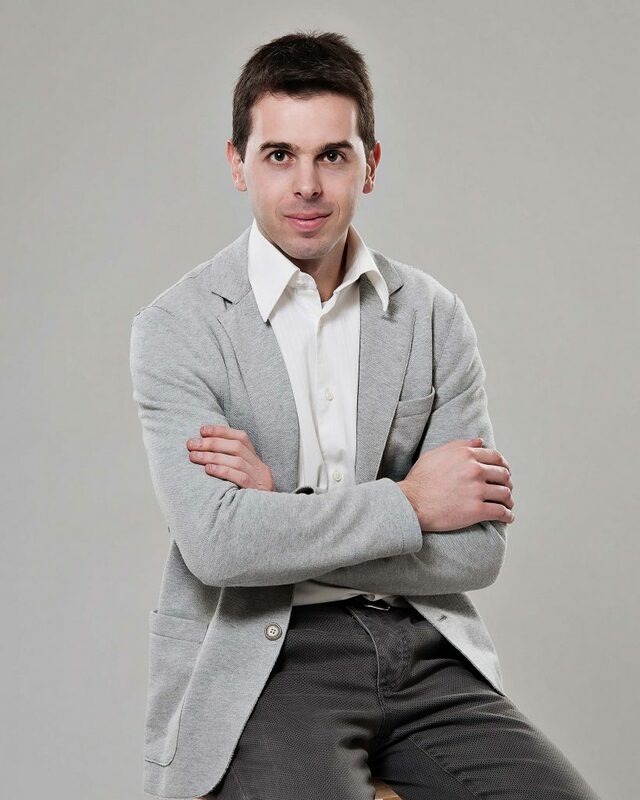 Mauro BERTOLI who by the way got the prestigious piano competition Arturo Benedetti Michelangeli for young interpreters has set up this service ! Classical music artists can also become startupers ! OD: Bonjour Mauro BERTOLI ! Before talking about your company, would you introduce yourself and your co-founders if any ? 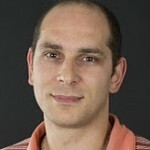 Hello Ramzi! Thanks for this interview. My name is Mauro Bertoli. I am Italian-Canadian. I moved to Ottawa 9 years ago, coming from Brescia, a city in the north of Italy. I am a concert pianist and currently I am piano accompanist at the Conservatoire the Musique de Gatineau as well as Part Time Piano Teacher at Ottawa University. I have an active concert career, as a soloist and chamber musician and at the same time I like to explore and develop different projects. For example I’m the founder and director of MitBravour Artist Collective, a management agency for classical musicians, and six months ago I decided to develop a new project, the website pianoaccompanimentstracks.com which provides to classical musicians and singers piano accompaniment tracks recorded at different speeds to support practice but also that can be used for a moment of leisure. I’m the solely founder of this venture. 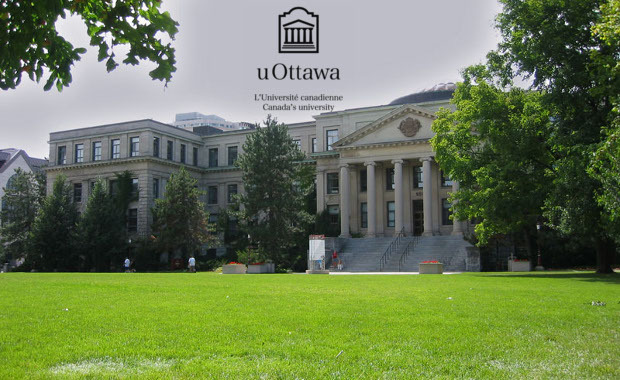 Mauro Bertoli : piano teacher @ Ottawa University & startuper ! OD: It’s nice to see that music teachers and classical music artists have seized opportunity given by the digital technologies ! Can you explain us how the idea to create your service PianoAccompanimentsTracks.com has come ? Working as a piano accompanist (or if you prefer collaborative pianists, there are often debates on how we should be called, although my personal preference would be simply “pianist”) I’ve met several students through the years and noticed that often they come to their rehearsals unaware of how the piano part sounds. This become an issue, in fact often I have to spend time trying to show and explain to the students how the piano part sounds together with the instrument. In other situation, for lack of times, often the pianist has simply to follow the instrumentalist/singer no matter what. The result is that the time at disposal is not invested to create a good collaboration between the two musicians, instead it’s a matter of finding a way to somehow reach the end of the work together. Sometime some of my colleagues have asked me to record the piano part of some works, so that their students could practice with the recording at home, and when I’ve done that I was pleased to notice that students that worked with the recordings were way more prepared at their rehearsals compared to the others. We could then spend our rehearsing time working more towards musical details rather than ensemble. This gave me the idea of creating the website pianoaccompanimentstracks.com which can offer such a service all over the world, and for all the classical musicians and singers. OD: Can you describe more precisely what is your value proposition and the main features of your digital service? The service we offer is pretty straight forward: piano accompaniment tracks for classical works (Public Domain only), that are recorded at different speeds so that even at an early stage of the preparation of a new work, a student can play along the piano. However some of our users simply wants to play accompanied by piano and have fun, so for them it’s more for a moment of leisure rather than practice. Being the website relatively new (only 6 months online), our catalogue keep being updated every week. In fact now I have created a Piano Team, a group of professional pianists from all over the world (and still I’m looking for new collaborators), who are recording on a daily basis new works. On top of that we receive requests from customers to record specific works, and we try our best to offer a fast and professional service. 1) the first one has been already mentioned in your previous question: the benefits that students can have from practising along the accompaniment since the early stage of learning a work. They were aware of how the piano part sounds, their sense of rhythm gets much stronger and they are also able to play better in tune. Eventually this can speed up the whole learning process, and all together I consider these points very important. 2) as a concert pianist I’ve been very lucky to be able to travel around the world to perform. I’ve been in important cities as well as in remote locations. While in big cities you can easily find pianists in every corner, that’s not the same in other areas where finding a pianist to collaborate with it’s an incredible difficult task if not sometime impossible. PianoAccompanimentsTracks.com is available worldwide, and it can become very helpful where a real pianist is not available. 3) I have still to meet someone that can afford to practice daily with a pianist. That’s why usually musicians tend to meet and work with a pianist only later on in their preparation of a work. And that’s when sometime they suddenly figure out that playing together is completely different than playing alone! The tracks available on this website are recorded at different speeds, and more than often at very slow speeds, so that everyone can start to work with a virtual pianist basically as soon as they decide what to play. You can use them as many time as you want and whenever you want! Financially, this is a great opportunity of saving $$. Of course these tracks are more structured, in terms of tempo and interpretation, compared to a live performance where other important elements (that can be experienced only in a live performance) add up. But thanks to the support you received working often with these accompaniments it will be much easier for a musician to gain the freedom of interpretation that they eventually will need. 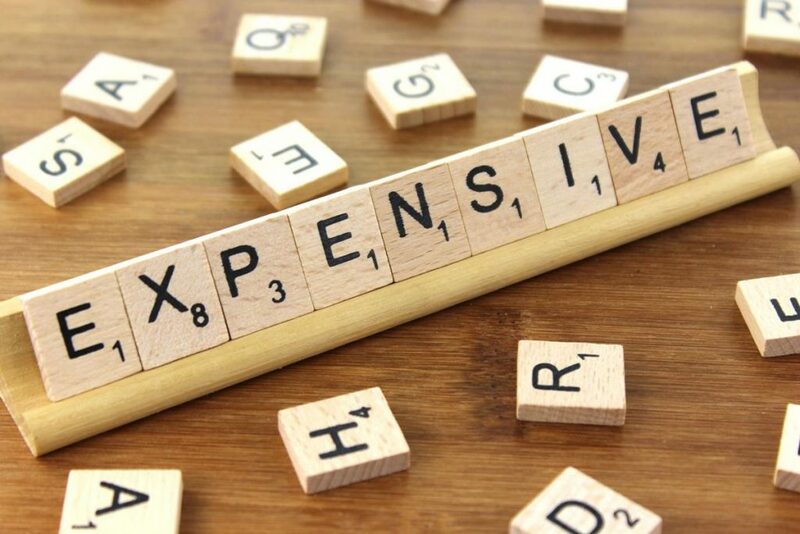 working daily with a accompanist may be expensive for young musicians ! 4) amateur musicians often feel shy to collaborate with a professional pianist. Often their piano partners are amateur musicians too, and may be sometime they do not have the skills to play advanced works. PianoAccompanimentsTracks.com give them the possibility to enjoy more their time with their instruments. 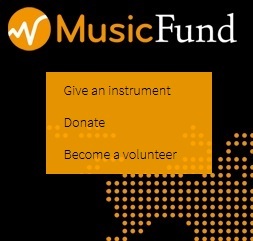 OD : There are already some other sites proposing piano accompaniment online ? What are you main differentiation features ? Do you want to other accompaniments for other instruments ? At the moment there are few competitors. Our offer differs mainly on two things: the files you can download at pianoaccompanimentstracks.com are WAVE file, while all the other website are offering MP3. So, in short, the sound quality is better, basically what you would get on a CD. The other option we offer is that we record each work at different speeds, from a very slow tempo to the possibly final speed. I like also to mention that the tempo is not changed through some software, but each track is individually recorded. Sometime you can find works recorded even at 5/6 different speeds because our customers can ask for a specific tempo, and we like to accommodate each request. I am planning to increase our collections which currently are for violin, viola, cello, double bass, flute, oboe, clarinet, bassoon, trumpet, trombone, French horn and voice (where we do have a collection for opera arias and one for songs). In the short future I’m exploring to add a section for choir works, and one for piano (there are several piano concertos out there!). Eventually we’ll explore other possibility too. My plan is that with time pianoaccompanimentstracks.com will become a reference point on the web for musicians (professional and amateur), music teachers and music schools. For now I’m proud to say that since January 2018 our tracks have been sold all over the world, in all the continents (well…except Antarctica!). We have thousands of visits each month and many positive comments/reviews.This makes me very happy and gives me the energy to keep working hard on this exciting project. 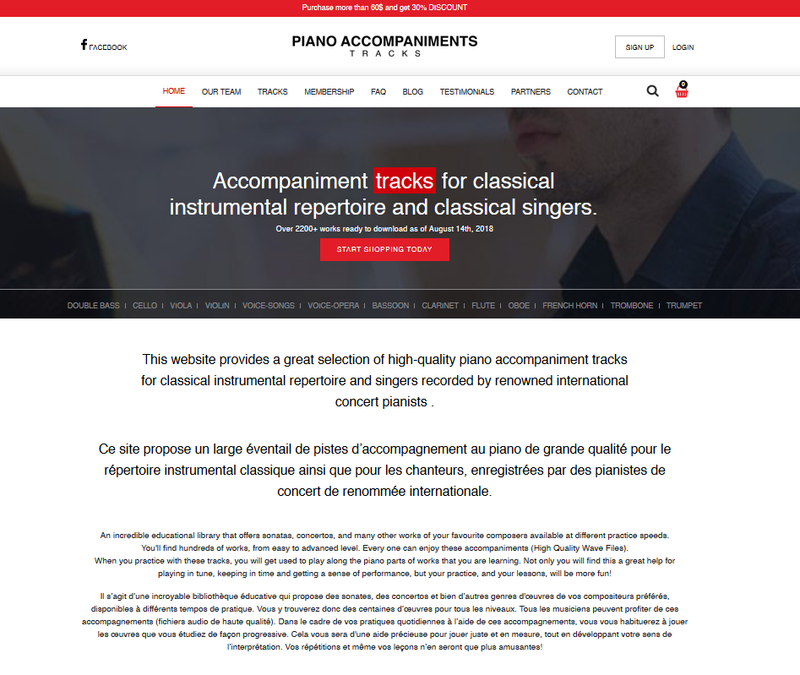 -the website of your accompaniment site : www.pianoaccompanimentstracks.com ! -and the facebook page of pianoaccompanimentstracks ! This entry was posted in Applications reviews, digital & classical, Interview, startup and tagged accompaniment, Canada, Mauro BERTOLI, piano, startup, teacher by Ramzi SAIDANI. Bookmark the permalink.